Apologies for the watermarks, but we noticed people are stealing our pictures for their websites. This installation was for a furnace that required an LPG burst for a period of 5 mins in order to get started. The consumption rate was 10kg/h but for a very short 5min interval per start. Due to the short take off, a double 5 vapour manifold was used. The project was completed in 12 hours but had extensive planning done before hand to achieve this. A cage/house was build around it after this picture was taken, little can be seen after that. Parts of the cage can be seen in the background against the staircase. 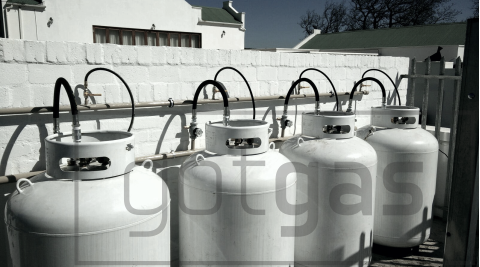 Lanzerac Wine Estate needed to change their hot water system, Got Gas (Pty) Ltd was contracted in to install all the Gas Tankless Water Heaters, as well as the network and supply end. 4 Dumpies were installed with a common fill manifold. 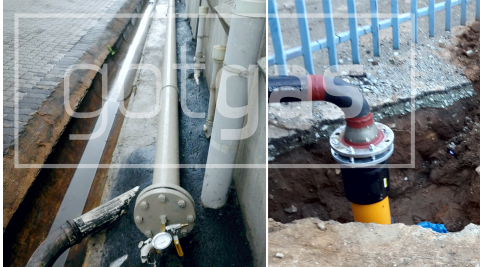 200m of 63mm HDPE pipe was installed 800mm below ground, to feed the various buildings. 32mm branch lines were taken off to from the main feed line. Total pipe run was in excess of 500m. The client in this case required a 5000GJ line to power an industrial boiler. The total pipe run was 120 meters which was split into 2 halves, the first being a subterranean run (first pic), which was 180mm HDPE (The pic is one of the Electrofusion elbows being fused), the second half was 4" Schedule 40 steel mounted above ground. We flanged the steel pipes to make it easier to work on since welding a pipe that distance can prove difficult to work on. Gas supplied by Egoli Gas. 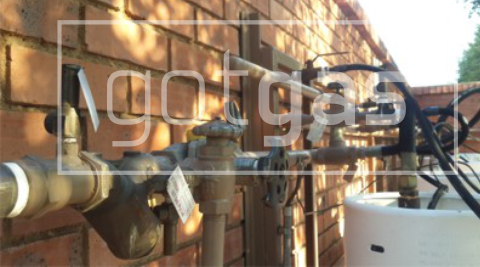 A building in Rivonia required 4 restaurants to have a supply of gas. This was Got Gas' first project where we still own the installation and the clients are metered off every month. All the restaurants opted for an amortization amount with a 3 year contract. Currently there are 4 Dumpies installed with 50m of underground HDPE 100kPa pipe. 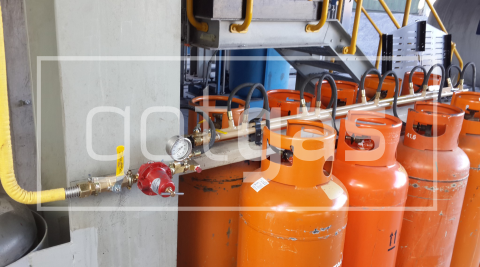 This feeds a central metering point before the gas is distributed into the restaurants. current consumption is 1.5 ton of LPG/month.